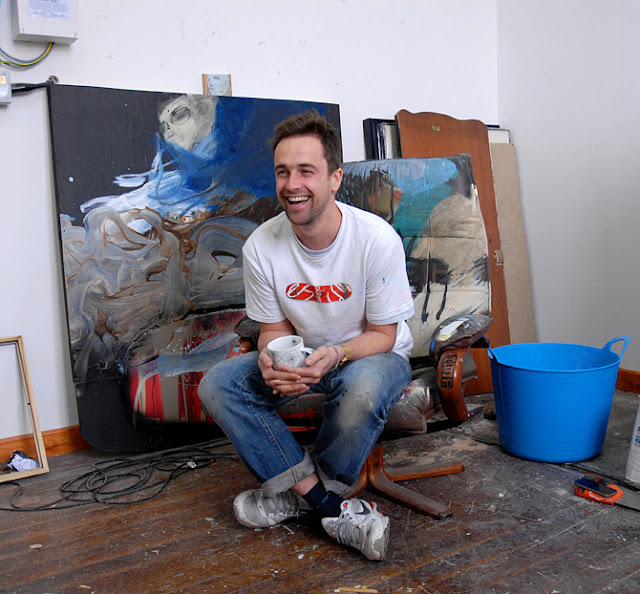 At the tender age of 29, Cornish boy Sam Bassett recently hung his first main solo show, Torn Anima, which is on until 24th April at the Millennium Gallery in St.Ives. Not wanting to attempt to describe the work – we'd prefer that you take it at face value when you go – we'll just say that it's unexpected. Not what you'd normally get from a Cornish artist certainly; no boats, no cliffs, no sunsets and no seagulls. Amidst the chiming voices of the local art vernacular, Sam's work speaks a separate, distinctly singular, language. So, above all, we were interested to know how Sam viewed his place in the local art scene and its celebrated heritage. So why did the change of heart in his trade lead Sam home to Cornwall? Surely his illustrative style owed more to urban art than a rural environment. Sam says he doesn't really know where he fits. Fair enough, these days artists can collaborate and form groups over the internet, so the sense of place isn't quite as important as it was. Stanhope Forbes and the Newlyn artists flocked together because of light and to document a scenario and an industry. But Sam and his artist friends have more of an individualistic approach to art, process and themes, and as Sam explains quaintly: 'it's less of an outlook and more of an inlook'. In this respect, he says he could work anywhere, but is quick to point out that the local landscape always creeps in, embedded into the background. So Cornwall does inspire him. In fact, the colours he picks come from the scenery – but it's just not obvious to an onlooker. Local people too have a massive impact on his work; being all about memory and observation, Sam' artistic themes draw direct inspiration from the characters and personal relationships from his life here. When Sam first came back, he had a show at Debbie Hall’s Orchard Gallery in St. Ives. He was surprised that they wanted to do something different. And locals appreciating and buying his work gave him confidence to think that people down here were up for new things, and he wasn't walking into a 'commercially-viable only' market. Sam loves that local galleries are pushing it. His view on the cultural scene is heartening: 'All I know is that in culture, music, art, whatever, you need diversity to be able to survive, otherwise things become boring. I'm happy to be in a town that can appeal to a good diversity of people'. Sam is clearly excited about the local art scene today: 'at the moment there's a great energy, with new studios and quite a few people creating – there's ongoing creativity here'. The show at Millennium was a specific ambition of Sam's. And with that under his belt, his next goal is to secure funding. This will enable him to push further with risky subjects and large experiments, and ultimately create a substantial body of work for a local public gallery. But he's also been contacted by galleries overseas, so Sam Basset may soon have a significantly wider audience. We asked him how he would label himself to a this international market, a Cornish artist? a Newlyn artist? He reiterated that art today is less about 'place', but he acknowledges his heritage, and his website proudly announces that he's a 'Cornish contemporary artist'. So other than some historical family ties, why did Sam choose Newlyn as his present home over St. Ives? 'It just feels a bit more real', he says. You can't argue with that. Sam's age is part of his appeal as an artist, so it's interesting to hear that the Millennium's next subject will be Trevor Bell, who is 82 this year. Sam, who has just turned 30, is at the other end of the scale in terms of experience. It is another way in which he sits apart from the norm. He says he feels privileged to be recognised so early on in his career, but when we asked him if his youth is an integral part of his art, his answer was simple: 'I think I'll always have a young head'. He hopes age will bring a different pace – enabling him to slow down and make some iconic pieces, but he wants to stay spontaneous and prolific. But Sam is already changing. He hints that future work might be inspired by nature; as a child he was fascinated by wildlife and would draw birds for hours. So his sense of place may be stronger than he imagined after all.